I am starting this off with a very heavy heart. So much evil and hateful activity has been going on in the world. There are many things I wish I could tell you to help you understand things a little easier. 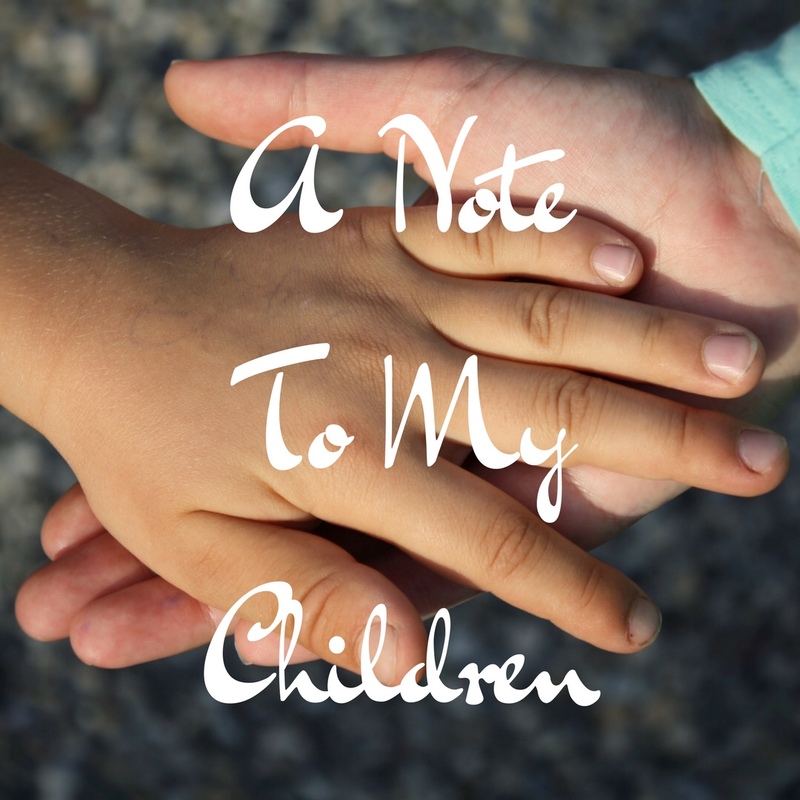 Writing this letter and getting it out will help my heart and hopefully maybe another parents, too. So many emotions go through my mind when I think about my love for you three. I am probably at the top of the list right now of most proud moms if there ever were one. Truthfully, I didn’t know who I was before I was known as a mom. Maybe that’s because that’s what god knew exactly what I needed at the exactly the right time. Because I can surely agree with that. Being your mom has brought me a new love I had never experienced before. And doing so with your dad by my side has been one of our greatest accomplishments. I strive to be greater for myself obviously, but that desire has been greatly fueled by being your mom. The will to make myself a better person and to get out of bed everyday. To want a clean home, to make a good income, and to provide good dinners. To make others happy. It’s all because of each one of you. There’s nothing in my lifetime so far that has been greater than that. Some people have a different life than others, and some parents get to experience finding themselves before having their children. The truth is, for me, is that I never knew who I truly was until I met you all and meeting each one of you was like meeting myself again for the very first time. The smile in your eyes and the joy you can see in your heart when you look at me. I love you guys so much that I never want to let you go. I think of the day when you will grow up and do great things because I know you will, and i get an ache in my heart just thinking about the distance we may someday have. But I know how selfish that is of me to think this way, and I know someday I will have to. I bring myself to tears looking back at pictures of you as babies and thinking just how quickly time really does go. A great reminder to always live in the present I guess, right? I know 100% that you will all do great things. Each one of you with your unique and oh so lovable personalities. I have needed each you since the day you were planted into my heart. The world needs you. Life has gotten so busy that some days seem to be harder than others, and sometimes those days see impossible to keep up with. I want you to know I look forward to the times that we get to spend together, one on one. As moms we strive to make times happen more. I wish you knew how much I really do need those times just as much as you. Without being a mom, without you three, I am nothing. I can’t even remember what I was, what I did, or what it was that my goals exactly were at the time before all of this started. God had a plan for us all and he knew just how much I needed each one of you in my life. I was young, scared, so scared, but I was hopeful. I knew that having you in my life would produce me the joy I had always been longing for and it has! At the end of every single day with you guys, there’s joy. No matter what the day. And that’s something not everyone gets to experience in life. We are blessed. Even on our hardest days we get to experience that. Our hard days make us all stronger and in my whole hearted opinion, they make us all understand each other better. Mama wants you to know that I accept you in all of your forms. I accept you when your mad, when your upset, when your being shy, when you are confused, when your silly, when your serious, and when your not so serious. I love all of the silliness you have. My heart thrives off of the smiles and the laughter, the giggles and even the screams and tattles. I really despise that day that I will be sitting here wishing I could hear it all again. I get frustrated sometimes, my feelings get hurt, and I lose my patience sometimes too. That’s something all of us humans deal with. I have witnessed you dealing with these emotions already and I want you to know that it’s ok and It’s healthy to have feelings and to express them in a healthy way. People being mean to others is NOT normal. But, unfortunately as you are starting to learn the more you grow up that there are mean people, everywhere. There are people that can and will make you feel ashamed for having the feelings that you have. They will put you down for being the person that you are or they will make you feel like you need to be someone that you aren’t and don’t feel comfortable being–stay far far away from them. From my experience– they drain so much positivity from your life without you even noticing at times. But, there are also some pretty amazing people in this world too, too just have to find them. Just like with anything else, good things are harder to find and take more time. Always do what you want and what makes happy, with the acception of being a good person and friend. Don’t let silly things stop you or get in your way from being who God has made you to be. If anyone ever makes you feel bad for being you or expressing you, don’t ever give them another second of your time. Those people aren’t worth it. Like the way others treat you and the friends you don’t have that you wish you did. We are all guilty of having these thoughts. It’s important for us to remember that God is always right there. And one thing I know for sure is that you can always always trust his plan. Life is never going to be as fair or as easy as you would hope it would be. And once you quit having any expectations for it to be, it will seemingly start to get easier. It’s all really about your mindset. Those of us who strive for happiness in life, will eventually find it. Don’t ever lose hope in that. Living a life with no regrets is really possible. It all starts with forgiving and accepting yourself. Know that YOU are loved, and you were chosen by God. You are treasured. I hope those three things become your inner truths. Mama loves you so.. Ashton, Isabella, and Ethan. You are my sense in this world, the pep in my step, and the crazy in my days. I wouldn’t have it any other way.